Watch for Wii™ and Nintendo DS™ equipped cars in a city near you! Play: Mario Kart® Wii, Wii Fit, and Brain Age. 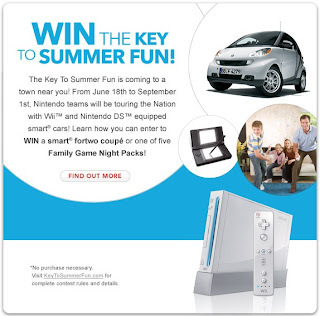 Grand Prize (1) - One "smart fortwo coupé" automobile and one Wii video game system. Secondary Prizing (5) - Family Game Night Pack; one Wii video game system, two Wii games, two Nintendo DS systems, four Nintendo DS games, and one Nintendo branded carrying bag.